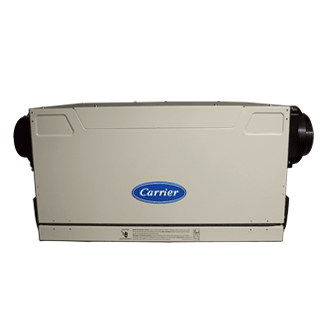 Carrier® Energy Recovery Ventilators (ERVs) are designed to minimize energy loss while bringing fresh air into your home and exiting stale air year round. Energy recovery ventilators use the outgoing air’s thermal energy to pre-condition the air coming in so you can enjoy fresh air without overworking your system. Energy recovery ventilators are best used in climates where the summer is hot and humid. 1 To the original owner, when product is used in an owner-occupied residence, a 10-year parts limited warranty upon timely registration of your new equipment. Warranty period is 5 years if not registered within 90 days. Jurisdictions where warranty benefits cannot be conditioned on registration will automatically receive a 10-year parts limited warranty. See warranty certificate for complete details.